Local historian Peter Christie suggests that the origins of the Pine-Coffin bust had as much to do with the timing of his death and the local political situation, as to the attributes of the man himself. 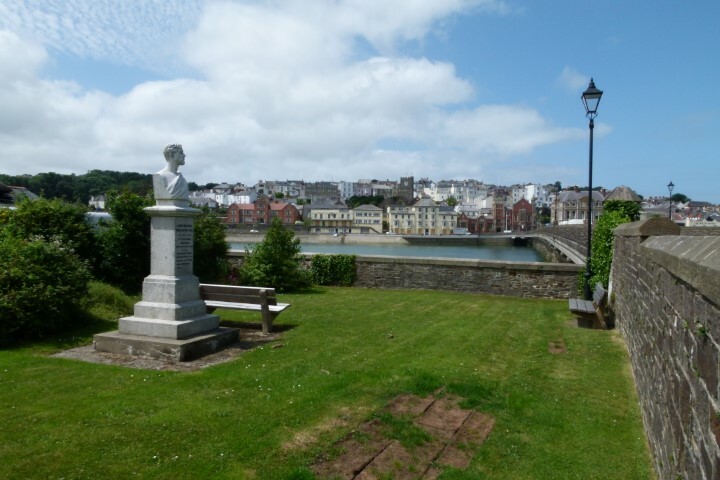 Somewhat earlier, in 1889, the death of the prominent North Devon Liberal Charles Willshire had been celebrated by erecting a memorial bust of him in Barnstaple Square. Bideford’s Conservatives, presumably wishing to suggest that they had equally worthy men in their ranks, responded by marking the recent departure of one of their own in a similar manner. The bust would have been very fresh-faced when John Oglander, writing from the Royal Castle Hotel, commented ‘The bridge seems to have a personality in Bideford and where you live depends on it. There are “East the bridge” and “West the bridge” folk.’ Such a perception seemed to persist well into the 20th century, but thankfully, with the rapid growth of Bideford, the bridge no longer provides quite such a clear demographic demarcation (unless you are in the rush-hour traffic trying to cross it).